This is a sword I absolutely love and represents my favorite era of swords. It's a Petersen Type Y Viking sword (falling under the Oakeshott Type X category; Petersen created a typology only for Viking swords and is based primarily on pommel and guard types, while Oakeshott's is for blade shapes of all sorts of swords of the medieval European era). This reproduction is a masterpiece of the talented young smith Michael Pikula of Volund Forge. 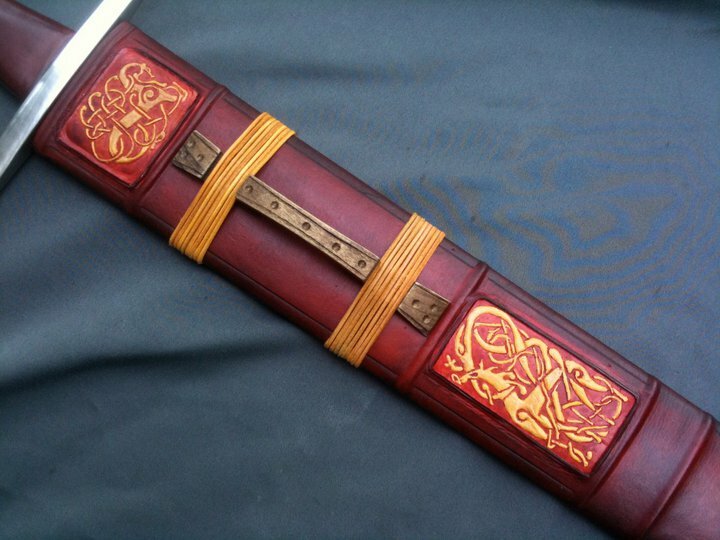 The owner sent it to hilt-assembly-and-scabbard-making guru Christian Fletcher, who fashioned this beauty of a scabbard of hand-carved poplar and covered in hand-dyed and tooled leather, complete with Urnes-style Norse artwork of his own design. As this design is the type of artwork I love and spend hours drawing, I asked Christian on Facebook how he tooled that leather, thinking I could do something similar. 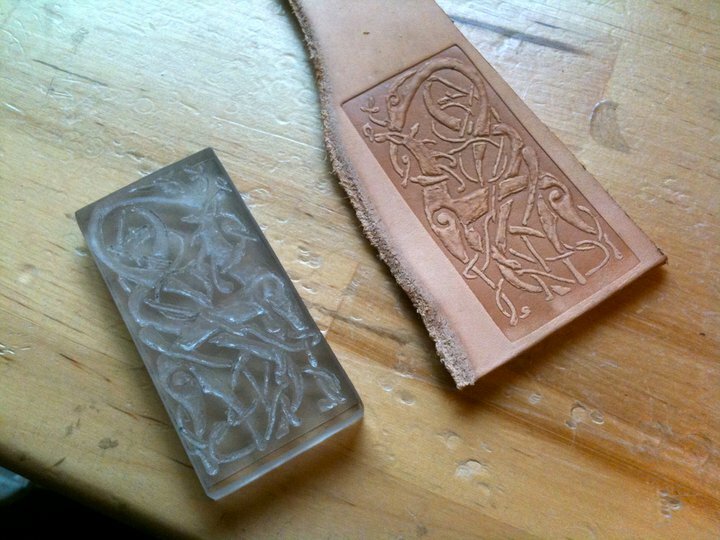 He shared this picture with me, where he had carved artwork onto a piece of polycarbonate and made a die to press into the leather. I whipped up this design on what looked to be a piece of polycarbonate I found in the shop scrap bucket. I then scratched it out with a scribe, and tried my untrained hand at engraving it, which turned out slightly repulsive. After I "carved" it out, I soaked a piece of leather in warm water, wiped it of water, and placed it against the polycarbonate die between two wooden discs and clamped it tight. We'll see tomorrow what I looks like! It's 3/8" thick and only mild steel, but should give me some good practice at grinding out the geometry. 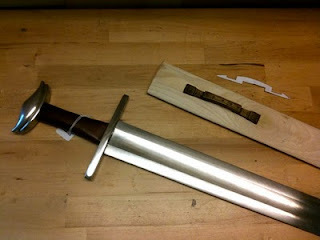 First I'll either mill or scrape out the fuller, and then grind a distal taper (graduating the thickness of the blade). 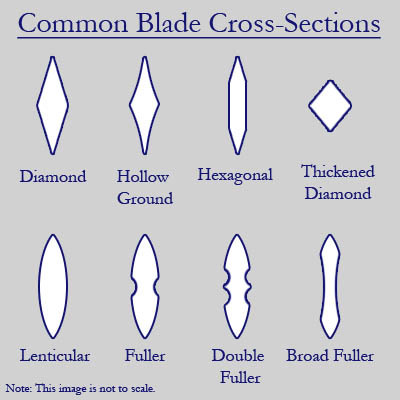 Then I'll work on the bevels, although it'll probably be more lenticular in cross-section than diamond. It's been too long - Finished seax!